A friend of mine from Honolulu wrote recently to ask how we monks stay warm. He’d read the reports about our chilly weather in Minnesota, and so I assumed he asked out of curiosity rather than desperation. Still, I’ve never been to Hawaii in the winter, and I’ve always assumed that winters there are not so bad. But perhaps they’re not as nice as I have imagined, so what follows is drawn from the monastic tradition and will conclude with my best advice for my friend trying to survive another winter in Hawaii. How we monks stay warm in the winter has become in most monasteries a question for the history books. After all, today we simply turn on the heat, like everybody else. But it wasn’t always that way, even at Saint John’s. For starters, the remaining chimneys that spike the roof of the quadrangle at Saint John’s testify that our fireplaces were once considered state-of-the art. On the other hand, there’s no denying that it was a real chore to keep them stoked. A framed photograph that hangs outside of our refectory is a sobering reminder that the “good old days” should always be qualified with a firm “so-called.” In that photo teams of horses are working their way across Lake Sagatagan, pulling wagons piled high with wood destined for hungry fireplaces. 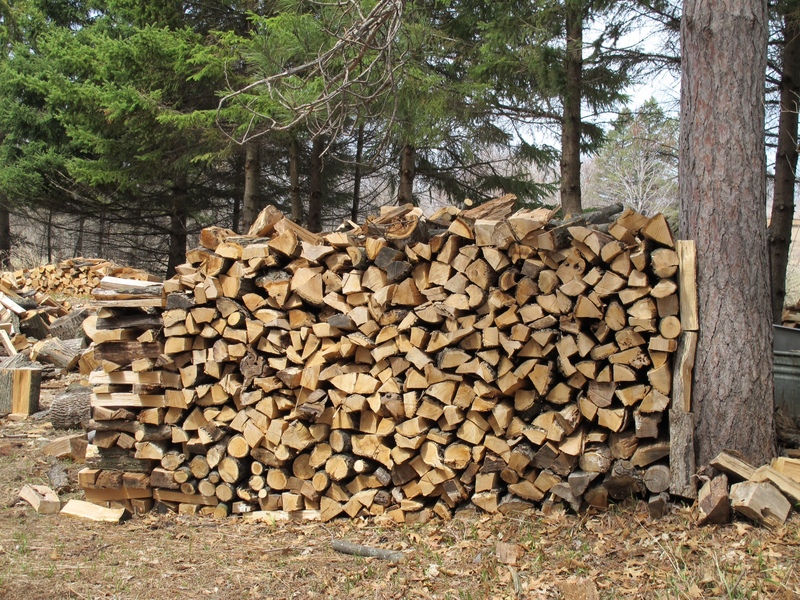 It must have been tedious, back-breaking and cold work, but but once inside the wood kept everyone warm — sort of. By medieval standards our fireplaces were luxurious, however. The fact of the matter was that the great monasteries of the middles ages usually had only one heated room, called the calefactory. There the monks gathered to warm themselves before heading back into freezing churches and unheated dormitories, refectories and cloisters. And the further north in Europe they went, the colder it got, both outside and in. Small wonder that medieval monks and their neighbors packed down as many calories as they could, because those calories spelled the difference between life and death. 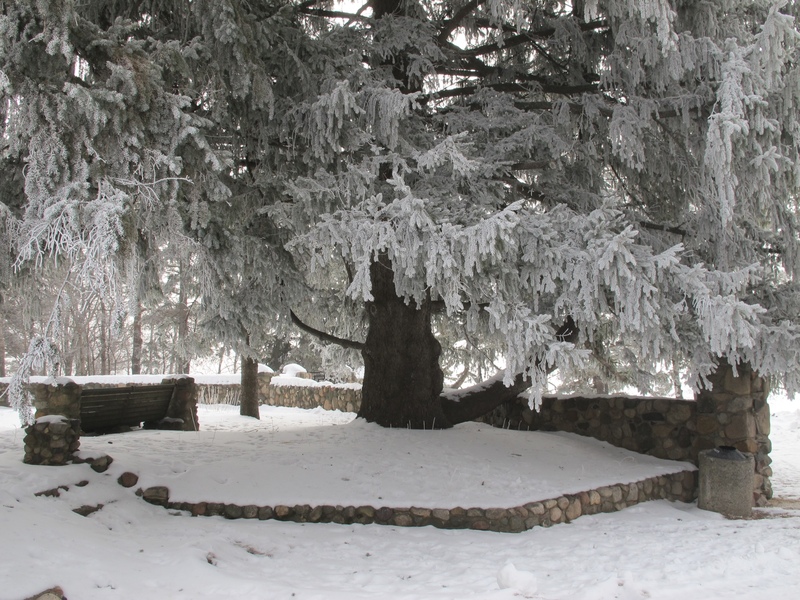 Staying warm wasn’t a lost cause, however, and there were positive steps that monks took to keep winter at bay. Architecturally monasteries employed passive solar techniques to harness the sun, and the design of cloisters tended to be standard across much of Northern Europe. In those regions, and at Saint John’s in the nineteenth century, the church was placed on the north side of the cloister. From there it would block the cold north winds and reflect the rays of the winter sun down into the cloister on the south side. Monks also planted wind-breaks, and where the site made it possible they would nestle the monastic complex into the south side of a slope. Taken together, these practices made quite a difference, and modern architects have begun to resort to these once again. But if there is one item that made all the difference in the world, it was clothing. If “clothing makes the man,” as the old saw went, then it was clothing that kept medieval monks alive through harsh winters. For good reason monks in previous generations wore heavier habits in the winter, except in places like the tropics. But they also wore the cuculla — or cowl — and this made life possible as they chanted away in cold and drafty churches. These were ample robes that slipped over the habit, giving a layered effect that worked really well. At Saint John’s many monks — including me — still wear the cuculla on the coldest days, and we’re grateful to our medieval brothers for bequeathing to us this gift. At Saint John’s the abbot clothes us in the cuculla when we make solemn vows. However, since this usually happens on July 11th, the feast of Saint Benedict, we have to take it on faith that someday these things will come in handy. But on July 11th they tend to be sweltering. It suffices to generalize that winter in the Middle Ages was tough for everybody, be they monks, nobles, serfs or animals. So it was that Easter joy was honest and not feigned in the least. People celebrated not just the risen Lord but also their personal survival through another tough winter. So if there is one negative about modern central heat, it’s this. Easter doesn’t have quite the personal punch that it once had. So how do we monks and our neighbors in Minnesota stay warm in the winter? Well, we give winter a poke in the eye by going ice-fishing, skating on the lake, snowmobiling and hiking. And we dress appropriately when it gets down into the 20s. And what’s my advice to my friend in Honolulu? First of all don’t let winter hold you hostage. Dress in layers. Don’t go out when the wind-chill drops to -20. And buy some ice-skates and skate while the skating’s good. It works for us in Minnesota, and it should work equally well for people in Hawaii. And lastly, on Easter morning celebrate the fact that you’ve survived yet another winter in Hawaii. +On February 6th I flew home to visit with my mom and brothers and sisters and their families in Edmond, OK. Expecting something a little better than the snow and cold I had left behind, it snowed on the first day at her home. +I received several nice messages in response to my post on Russell Baker two weeks ago, and the most surprising came from an alumnus of Saint John’s University who had graduated in 1976. That year Russell Baker happened to be the commencement speaker, and at the end of the ceremony the alumnus asked Mr. Baker for a copy of his speech. The latter obliged him by thrusting forward the copy he had used for his delivery, complete with his hand-written edits. The speech opened with a demonstration of Mr. Baker’s wry sense of humor. He warned his audience that he was opposed to capital punishment, and that he considered commencement speeches to be a form of capital punishment. But contrary to his warning, the speech was not torture at all. +I’ve assembled a rather eclectic group of photos to illustrate the point about monks keeping warm. At the top of the post the photo shows my favorite tree at Saint John’s. It sits in the monastic garden, and one giant limb rests on a stone wall. 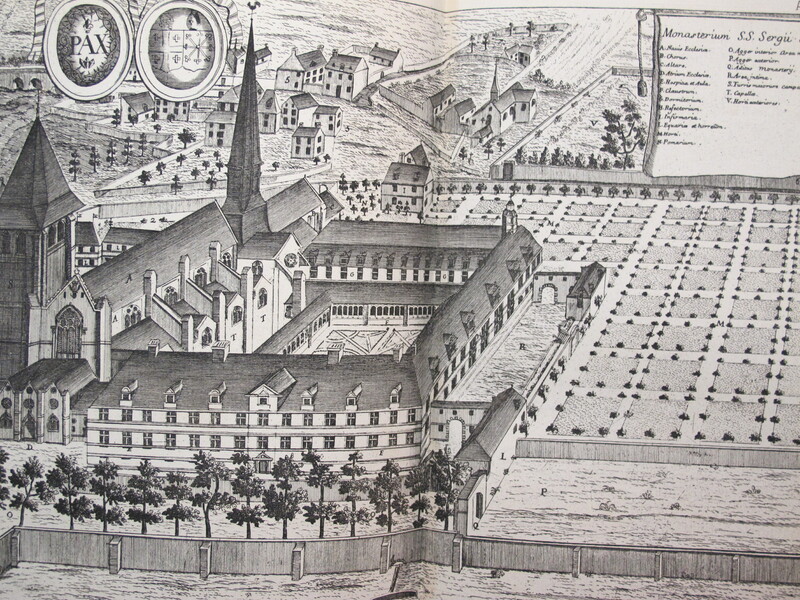 Next is a 17th-century engraving of the Abbey of Saint Serge in Angers, France. 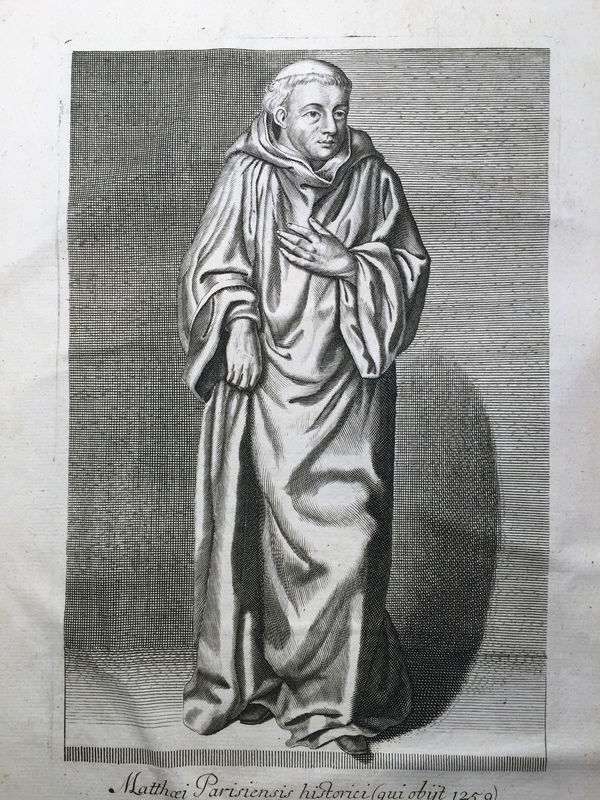 Below that is a 17th-century engraving of the 13th-century monk and chronicler Matthew of Paris, modeling his cuculla. At bottom are two photos that remind us that we still have three working fireplaces in the monastery. Fortunately we have lots of fallen trees to harvest each year. Equally good is the fact that we don’t have to rely on them to stay warm through an entire winter.